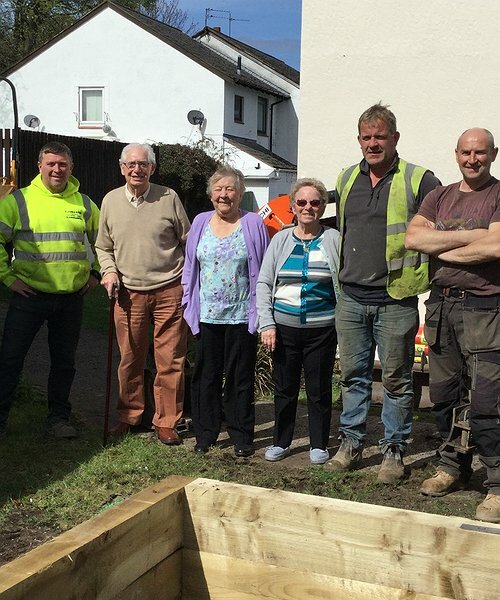 Travis Perkins Managed Services donated £ £532.58 of materials from their Legacy Fund and local contractors E. Jones and Sons donated their time and resources as well as five tonnes of topsoil to create a new raised veggie-bed for the residents at Pentre Mawr – a sheltered housing scheme managed by Clwyd Alyn housing Association. North Wales Garden Centre have also donated £100 of shrubs, perennials and bedding plants to brighten up another area of the gardens. “It’s been a brilliant team effort with some great help from many of our friends in the wider community,” said Alison Pring, Warden at the scheme. “We’re now really looking forward to planting out the new beds – and hopefully harvesting some tasty produce too,” added Alison. "Paned and chat at the Old Court House"
"Former homeless get creative at art workshops"